In April 2013 A-POST Aluminum Fabricators was purchased by brothers Brent and Mark Metcalfe. The day to day management is overseen by company President Brent Metcalfe. 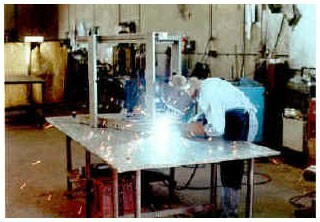 A-POST Aluminum Fabricators was started by Arnold Postel in 1980. Walter Schroeder purchased the business in 1996. In addition to being certified with the Canadian Welding Bureau, the company is also a member in good standing with the Winnipeg Construction Association and the local Chamber of Commerce. Our plant includes over 23,000 sq. feet of fabrication and storage space. Overhead and jib cranes allow for efficient loading/unloading and accurate positioning of materials. Modern, well maintained equipment gives our employees the ability to build strong and precise products.